that is to have succeeded." 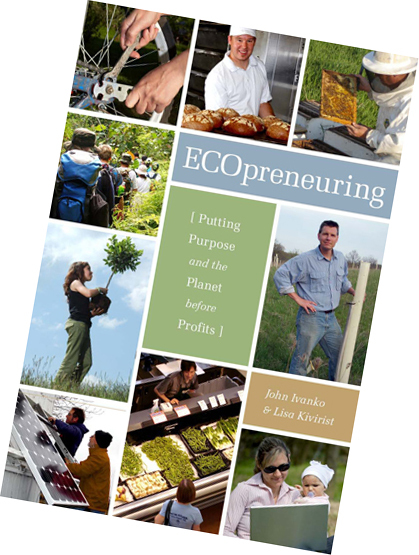 While ECOpreneuring provides an in-depth exploration of many aspects of starting or operating a green business, the book couldn't cover it all in 224 pages. The following provides additional resources and information for you to achieve your green dream business success, however you come to define it. A growing list of resources from around the world can be easily tapped to help in the development of your enterprise. The IBP is the first business planning software product designed specifically to operate on the Internet. The IBP uses the capabilities of the Internet to assist entrepreneurs in preparing a 3 year business plan for their new or existing business. Sign-in required. Revised (and Simple) Sample Business Plan provided as reference to the vision behind the award-winning Inn Serendipity Bed & Breakfast. The following non-profit organizations have come about to serve people interested in starting, working in or managing non-profit organizations. This is the leading authority in the US on philanthropy, connecting non-profits and the grant-makers supporting them to tools they can use and information they can trust. The Center maintains a comprehensive database on US grant-makers andtheir grants. It also operates research, education and training programs designed to advance philanthropy at every level. This organization connects people, ideas and resources to change the world. The foundation advances systemic change to benefit communities around theworld by investing in, connecting and celebrating social entrepreneurs and supporting social entrepreneurs through grants, research and resources. Resources for anyone searching to prosper as a "social entrepreneur." Order your copy of ECOpreneuring today at a 22% discount off list price and get it signed by the authors (a PDF file order form).